Vodafone, launched “ Music SUPER WEEK” offers wherein its Postpaid and Prepaid subscribers (2G and 3G) can download Unlimited Songs FREE on their Mobile Phones! 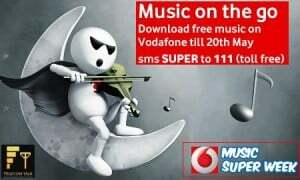 This week all Vodafone customers across all the circles can enjoy Unlimited FREE Music Downloads one their Mobile phone. This offer is only valid for mobile sites only and available for one week (7 Days) from 14th May: 00:00hrs to 20th May: 23:59hrs under MUSIC SUPER WEEK Offers. To avail the offer subscriber needs to send SMS ‘SUPER’ to 111 (toll free). You will get a message with the link to super weeks page – http://m.vodafone.in/superweeks/. On this page, there will be links to the sites which are a part of the Music super week.The Subscriber can download a maximum of 10 free songs in a day from the pool of songs shown on the page. Thanks for writing in to us and for the time on our call, hope we were able to help. If you still face any difficulty, please change the handset and share your feedback with us. For any further assistance, please email us at [email protected], we’ll do our best to help.